I found all those cool graphics on the web. Free. And I've started a contest to find other glam gals out there. If you are or have a friend or ton of friends who are glamgals, let me know. We're starting a network/association/friendship chain... fill int he pc words here. We want to be in touch. I've heard from my friends that what they really want is the dish on what the shopping was like and hey.... the inside scoop. I agree. I was so rushed on this last Italy trip that I felt more like I was surviving than reporting and having fun. New camera to learn. 8,000 steps to negotiate and 11 other villa mates to please. You see I'm a Taurus and we please. One of our fellow travellers, Amy said to me half way through the trip. "Judith, you seem so calm. You're not upset about the fact that we have no towels and the ants have taken over our bathrooms and the kitchen. And... then she dished about one of our other buddies. I hadn't thought about it, but I guess I was calm because I was in shock. 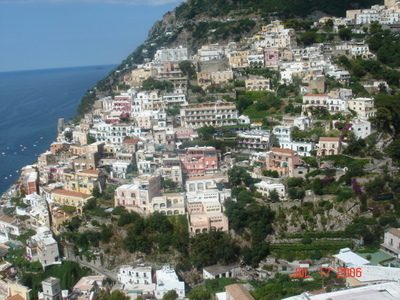 July 16-23: Sorrento and Positano: dining, shopping and death defying trails. 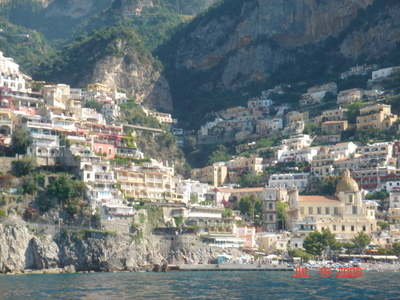 Positano is a combination of impossibly built cave dwellings with multimillion dollar locations and views. Think Shangra-La with the town being sunk into a valley surrounded by sheer cliffs. Getting there isn't easy, especially if you travel the coast road. Think the windyest road in the world (San Francisco's Lombard Street) and combine it with U.S. Highway One. Then multiply the twists and turns by ten. After you learn to focus on a set point...like Nureyev, and your stomach stops wretching at the sight of a full size bus coming at you head on around around a hair-pin curve, it's quite a magnificent drive. That said, I would highly suggest you not drive it yourself. Hire a car and driver, take the train, or go on one of the delightful ferries that connect Naples to Sorrento, Positano, Capri and Amalfi. We chose the car and driver because of our luggage. As usual we brought too much. Driving services: www.amalfilimo.com and www.positanobluporter.it We used the latter and were quite happy. On the road: We set out from Naples around ten a.m and then half an hour outside of the city, returned to our hotel when my hubby realized his cell phone (which didn't work in Europe anyway) was missing. Of course we later learned that it was safely packed in his Ferragamo loafer and didn't want to be found, but .... well, we won't go there. Needless to say a little goes a long way. Don't even think of driving to Positano after having some Limoncello!!!! That is unless you have a need to die. # 14 Pelletteria Iolanda (inexpensive belts and leather goods), #24 Leonard (books), #26, Di Angelis (jewelry), #35 La Lanterna (wine.. buy some local wine with no sulfates! ), #49 Lombardi (Lace), #55 L'Aquilone (coral and cameo), # 57 Sorrento Profumi, #62 Cioccia (clothing), #67 Scotti (leather sandals), #91 Manatthon (ceramics) and #93 Lucy (table linens).
" Positano has been called the Pearl of the Amalfi Coast for its many special characteristics that raise it above all of the other towns on the coast, and we could call Villa i Fisici a pearl among the residential properties along this stretch of coast. Its position allows you to enjoy a unique view of the town of Positano and of the gulf. From its large terraces you dominate, as if on the captain's bridge of a ship, the typical whitewashed houses that slope down, one on top of the other, right down to the sea. Villa i Fisici goes back to the 1700s and after several restorations during this time, it has now been completely renovated with the idea of turning it into a prestigious residence for holidays. And all of the plumbing, electrical system, bathrooms and equipment have been completely overhauled using the latest techniques, and the kitchen has a professional edge with every possible accessory. The furnishings are partly antique and those that are not are inspired by the original era of the villa, which is on three floors, each of which opens onto a large panoramic terrace, elegantly furnished. On the lowest terrace they have made a swimming-pool with sun-bathing terrace and a corner bar with refridgerator and ice-maker. You reach the villa on foot up an attractive little alley-way of about 100 metres, and our guests can use a baggage-carrying service both on arrival and on departure. The beach is reached via a series of stairways. " Note on the descripton. "You reach the villa on foot up an attractive little alleyway????????" Hahahaha. Yes it is attractive but the slope is something akin to Kilamanjaro. The poor porter carried our fifthy pound bags over his shoulder...tied together which means he was carrying 100 pound.. up the slope, up more stairs to the villa and then up once again to the sleeping quarters. And he did it without breaking a sweat. Mama Mia. Positano is not for the frail or recovering heart attack patient. I estimate that we walked 500 stairs down and up each time we went to the village. There are taxis from town to the bottom of the hill leading to Villa i Fischi but from there it is still a climb. Staying in a hotel is more accessible and car services are wonderful. We used the Blu Porter service to take trips to Amalfi and Ravello. They have many different cars and vans, all air conditioned and with drivers who speak enough english to communicate. (tel. 089.811496) The good news is that no matter how much you eat, you will sweat/exercise it off! Shopping: The village is accessed by car via the main square, Piazza dei Mulini. From here to the sea, the only way to get around is to walk. The walkways are cobblestone in places, hilly always and slippery if wet. Coming into town the upper coast road goes by the name of Via Marconi. Along this road you will find a few cute boutiques Bon Bon (#390) and Cabiria (#148). Then from the town hall to the west is a one way street, Via Pasitea which dead ends into the main upper town square. Along Via Pasitea look for Carro Fashion (#90) La Bottega di Brunella (#72), Nadir (#42/46), Moda Bluff (#330) and my favorite La Sirenetta (# 29-31-33). Looking for the colorful regional pottery, try Umberto Carro (#98). On the way out of town the upper road is called Via Cristoforo Colombo and here you will find Ceramica Assunta (#97) which specializes in the charming pottery from Vietri sul Mare. If you are a real collector, it's probably worth a trip to the town of Vietri Sul Mare where you can purchase at the factory store and save about 25% off US prices. Back to Positano, another must boutique on Via Cristoforo Colombo is the very tony Hotel Le Sirineuse store located across the street at # 103. Be still my heart. Now to the main shopping street and your trek to the sea. As you wander down Via dei Mulini you will be overwhelmed by a gazillion shops, one cuter than the next. For the most part, the clothing stores specialize in gauzy resort wear and bathing suits. There are also a plethora of tee shirt and souvenir shops and even a good art gallery or two. Ceramic boutiques round out the mix. 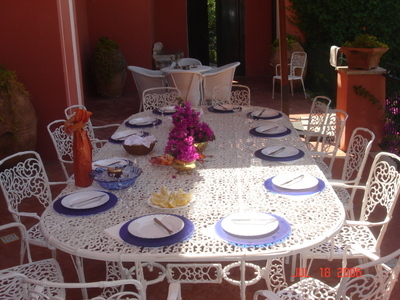 As in Sorrento, lemons are the main theme. Dining, if not at one of the many lovely hotels, takes place around the beach/port and in the shopping district. All the restaurant serve divine fresh fish plucked from the sea, usually that day. See my album photos for the pics. Lining the pebbly beach, our favorite restaurants were: Buca di Bacco , Le Tre Sorelle (Three Sisters), Chez Black and La Cambusa. For the more adventurous, there is Da Adolfo (accessed by boat from the waterfront - look for the big red fish on its side) and the two restaurants perched above Positano in the little village of Montepertuso: Donna Rosa and Il Ritrovo. Donna Rosa is a little more formal, and Il Ritrovo more rustic. Both are worth the climb or ride. I'm getting hungry. Prego, the buffala mozzarella. The post following this one looks a little like Haiku. Sorry about that. I wrote it in MS Word and copied it to typepad. Obviously I am doing something wrong! I am told that learning new things keeps the brain agile and young. Pretty soon I will be sucking on my pacifier. Come to think of it... that sounds like a good stress reliever. Anyone with younguns who wants to send me one?????? was relatively flawless. Dinner was delicious…lasagna and then perfectly braised salmon. Now if Alitalia can do it??? Are you listening USAir? I watched a bad Harrison Ford movie in which his wife and children are being held hostage so that he will rob a bank for the bad guys and of course he outwits them in the end. Security getting off the plane and entering the terminal was practically non existent. Lines were short, we didn’t have to fill out any paperwork. No one even asked the purpose of our visit. Customs? Non existent. Of course we had checked our bags through, but still, we could have met someone in the domestic terminal and passed on all sorts of goods. And like all the European airports, the baggage trolleys are FREE. Are you listening USAir???? I mean, it is truly insulting that we (Americans) charge arriving passengers for the use of a baggage cart. It gives a bad first impression and for those of us who travel a lot, is just an annoyance. airport even has these cute little carts that can be used to schlep rolly bags and hand luggage. It’s so damn civilized. she would look like a hipster (is there such a word anymore), but here she looks chic. Which brings me to the subject of how Italian women dress and why they always look chic. I’m especially fascinated because for the most part, they represent “glamgal.” The clothing isn’t always expensive. And the combinations are sometimes odd. But the ones who pull it off have an attitude that reeks of glam. They feel good about themselves, or if they don’t…they sure act like they do. Take a look at some of the women I photographed on this trip and you might see what I mean. Is it the sunglasses? The small designer (fake or real) bag? The hair? Most Italian women have gloriously thick hair. And please excuse all my generalities. they had processed 4,000 folks. And were expecting another 4,000 in the afternoon. Because we were politically and socially early, we’ve had lots of time to lounge, dine, and sit. I expect to gain ten pounds on this trip at which point my agent will commit me to a fat farm where there is no pasta, no Chiati, no Barolo, and no food. I will go willingly. But for now, I am going to enjoy. I am a Glamgal. , and the last time was with our children in tow. Not that I didn’t love the trip. Exposing one’s children to life’s experiences and the bigger world is one of the joys of parenting. As a matter of fact, I said “I’m having so much fun” to the point where both Lauren and Ross would put their hands over their ears. But I did get great pictures that I can use to remind them of how wonderful their childhood was. So… fast forward to today.
. I thought I was the smartest book on the planet. I booked a two for one fare through American Express. Only to learn that our friends, traveling to the same place had saved $2,000 booking online with Orbitz or one of those other services. Nevermind. We’re going to have fun. So we checked into our Pgh/Newark connection two hours before we had to. And now we have checked into our Alitalia connection two hours before we have to. Good news is that we got upgraded and have a pass to the Alitalia lounge run by Virgin Atlantic. Woah. Walking in the door seems like going through a space time shift. We’re in Austin Powers Shagland. I kid you not. The room is bathed in pink neon light and the chairs are cheap version of Aaron Saaronson. Actually he would die if he saw them. Everything is lined up neatly around white formica tables. I expect the teacher to walk in at any moment and hand out the finger paints. But wait , it gets better. Steve and I have found and secured one of the few “couches”. Around us are the other travelers who make me want to order the fashion police to come in and arrest them. There are a few decently attired folks… but what’s up with the thirty something with backward cap and … well probably expensive torn jeans. Lots of business guys in golf attire. where we will be with four great couple friends. So, this blog thing has proven to be a challenge and now I am off to Italy for ten days. It's odd because I consider myself somewhat of a techno weenie (my husband's term). I'm the one who fixes the computers, changes the lightbulbs and knows where everything is stored. An aside. My favorite husband story is when we donated our home for a Girls Hope charity event. The organizers came in and moved out the furniture to create room for the guests. Next morning I'm sleeping in and the volunteers arrive to put things in place. I'm dreaming of warm sandy beaches when I'm shaken awake. I answer with a grunt. More shaking, maybe an earthquake. "Judith" Now I recognize the voice. It's Steve. Should we be running for the hills? I open one eye. "What? I'm sleeping." He looks confused. "The people are here to put the furniture back in the living room." I smile. "That's nice." and close my eyes again. I love organized folks. Shaking again. "Judith." This time his voice is anxious. I open both eyes. "Yes?" "Honey, they need to know where to put the couches." It takes a few seconds for this message to filter through my shade. "Huh?" Now I am alert and raise up on one arm. "You look like the fellow I've been married to for, what is it, twenty years?" So. I'm going to conquer this blog/vlog thing and post some awesome things. Just close your eyes and I'll shake you awake when it's time. I'm back from California and wondering why I ever left. Seriously, the weather was spectacular, the flowers and plantings extraordinary and the beach ... well sandy. 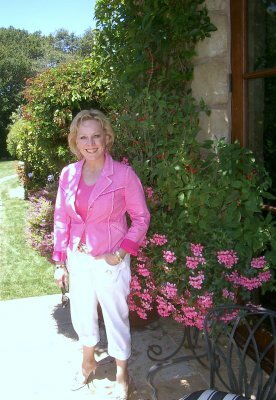 Check out my Santa Barbara photo album for some examples and to see my California personalized plate. Yes, everyone has to have one!